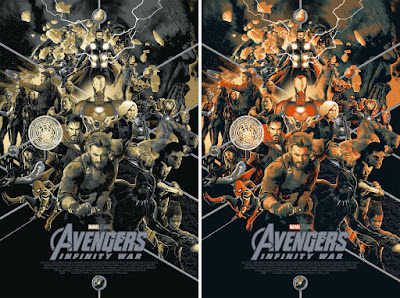 Mondo has an incredible line up of San Diego Comic-Con exclusives once again this year, including this epic movie poster variant screen print for Avengers: Infinity War by Matt Taylor! You know the amazingly talented UK artist is having a good year when he’s asked to design not one but two Marvel Cinematic Universe movie poster screen prints for Mondo to be released at San Diego Comic-Con 2018. There’s a reason he’s a SDCC featured guest artist this year! Collectors can purchase this hand numbered print at Mondo’s SDCC booth #435 starting when the doors open on Sunday, July 22nd, for $80. Avengers: Infinity War by Matt Taylor is a 24”x36” hand numbered screen print. The San Diego Comic-Con 2018 Exclusive Variant is limited to 325 pieces, while the Regular Edition ($60) will be a timed edition that will be available for purchase at the Mondo online store starting on Sunday, July 22nd, at 11:30am CDT through Thursday, July 26th, at 12pm CDT.